BOSTON — Specialty medications have emerged as one of the fastest-growing segments of the overall pharmacy field. But while the specialty segment has garnered headlines mainly for the financial boon it has provided to some manufacturers or others within the industry, a Walgreens specialty pharmacy here provides a revelatory look at what these specialty facilities can mean to their patients. The “Community” location on Stanhope Street in Boston is entirely devoted to pharmacy; there is no front end. It is no exaggeration to say that it represents a vision of the enormous potential for specialty pharmacy to make a positive difference in patients’ lives. It is managed by Christopher Casale, who leads a staff of approximately 20 employees, including five full-time licensed pharmacists in addition to him. “Our goal is to help our patients achieve the highest adherence rate possible,” says Walgreens specialty pharmacy manager Chris Casale. For Casale, specialty pharmacy was a natural career choice. His undergraduate degree at the University of Southern Maine was in premedicine, with a major in biology and a minor in ­psychology. Although he was accepted to medical school, Casale was dismayed at the cost and the prospect of paying off massive student loans. While working as a pharmacy technician at the Maine Medical Center, the pharmacy director observed Casale’s skill and empathy in working with patients and suggested that he apply to pharmacy school. As a result, Casale entered the Massachusetts College of Pharmacy and, thanks to the strength of his undergraduate background, completed a five-year program in two years — all while working full time as one of the lead pharmacy technicians at Tufts New England Medical Center. After graduation in 1992 Casale joined CVS as a pharmacy intern in 1992, then a licensed pharmacist the next year, and shortly after that he became a pharmacy manager. After being involved in the development of CVS’ specialty pharmacy division in the mid-1990s, Casale took the opportunity in 1999 to participate in opening one of the first specialty pharmacies in New England. He joined StatScript, a specialty pharmacy chain that had decided to open a location on Stanhope Street in partnership with the Boston Living Center, one of Massachusetts’ largest HIV service ­organizations. In 2005, StatScript’s owner, Chroni­med Inc., merged with MIM Corp. to create BioScrip Inc. In 2012, BioScrip sold its community specialty pharmacies and mail order pharmacy businesses to Walgreens. 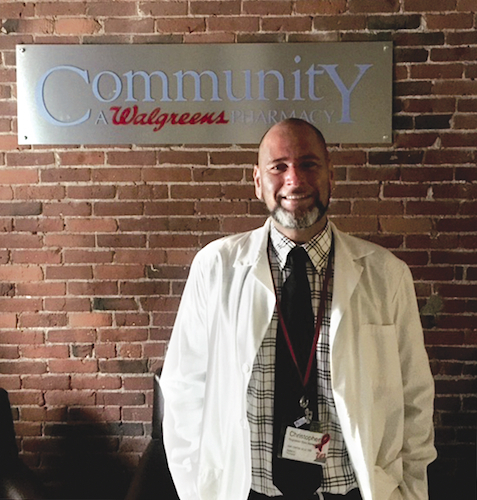 As a result, Casale became a member of the Walgreens team, and he quickly realized just how serious the company was about developing the full potential of community-based specialty pharmacy. Walgreens provided infrastructure, technology and additional training that enabled Casale and his team to take the pharmacy practice model they had created and developed to serve the HIV community and extend it to additional patient communities focused on other complex disease states and conditions such as cystic fibrosis and organ ­transplants. In fact, the scope of practice for Casale’s pharmacy has grown both geographically and functionally. It is licensed as a nonresident pharmacy in Maine, New Hampshire, Vermont and Rhode Island. Moreover, the pharmacy works closely with Walgreens’ traditional retail pharmacies and with the company’s central-fill pharmacies to educate them on specialty pharmacy. It has also become a training site for future site managers and pharmacy managers of other Walgreens specialty pharmacies. Beyond that, Casale and his colleagues are medical educators to patients and providers in their communities. He notes that he and his pharmacist colleagues have all undergone additional training and are well versed in the disease states they care for. As if that did not make for a full enough day, Casale also serves as an adjunct professor and preceptor at four New England schools of pharmacy. In addition, he sits on the Massachusetts Department of Public Health’s HIV/AIDS Scientific Advisory Board. He notes that one major difference between a traditional retail pharmacy and a specialty pharmacy is that the specialty pharmacist is able to devote more time to patients. However, expectations are also higher: Whereas 80% or greater adherence is considered optimal in most standards of care, in the specialty arena that percentage may result in treatment failure or treatment resistance, he says. During those calls, the specialty pharmacists are trained to detect even subtle “red flags” that signal nonadherence and immediately address such issues as adverse reactions, managing side effects and medication tolerance. They also provide guidance on navigating insurance benefits. In addition to higher goals, by the very nature of its patient base the “Community, A Walgreens Pharmacy” in Boston tends to have more high-risk patients with additional treatment challenges. For example, HIV patients tend to have additional comorbidities, including depression, diabetes and hypertension. Moreover, substance abuse is often a factor, since 25% to 35% of patients with HIV or hepatitis-C acquire the disease through intravenous drug use. In addition, the Boston facility is involved in developing transitional care programs for hospital discharge patients and even released prison ­inmates. Nonetheless, Casale says that his pharmacy’s patients achieve very high adherence rates, which have gotten the attention of many physicians who refer their patients to the pharmacy and ask Casale and his colleagues to provide in-depth counseling on their medications and even explain their laboratory results. These efforts have convinced Casale that the role of the pharmacist truly is evolving and that there is even greater scope for him along with his colleagues to take on greater roles in health care delivery. That fact, and recognition of the positive impact he and his colleagues can have on their patients’ lives, provide plenty of ­inspiration.